While wood-frame buildings have a history of cost effectively achieving energy-efficiency objectives, energy codes and standards maintain the minimum thermal requirements for building enclosure assemblies. The IECC sets minimum energy-efficiency provisions for both residential and commercial buildings and offers two methods for showing compliance: the prescriptive path and the performance path. The most recent IECC requirements are from 2018; however, for commercial wood-framed walls, there have been no changes or updates since the 2015 edition, so the previous standards still apply. The prescriptive path of the code sets specific minimum performance levels for each of the components of the building envelope. The design of the building is parsed out into each component of the envelope, including wall insulation, window U-factor, air infiltration, and solar heat gain coefficient (SHGC). Under the prescriptive path, each component must meet or exceed specific performance requirements, without the ability to tradeoff between components. Although the prescriptive path can be more rigid to follow, this option is very straightforward and can be easier to meet. The prescriptive path can be considered the R-value path in which each material (component) must meet a specific numerical requirement for resisting thermal or heat transfer. Note that a higher R-value is better when considering the reduction of heat transfer. The performance path can be thought of as a U-factor guide that allows for tradeoffs between components, as energy calculations are used to determine if the tradeoffs result in performance that is equivalent to the prescriptive requirements. The U-factor is the reciprocal of the R-value and indicates the rate of thermal transfer. The lower the U-factor, the lower the transmission rate and the better the thermal performance or efficiency. While the performance path offers more flexibility, it requires a closer look at each specific building envelope component and how they perform together to ensure ultimate compliance. At times, use of the prescriptive path is required if, for instance, a commercial building design exceeds 40 percent window to wall area. A third path for compliance is to follow the American Society of Heating, Refrigerating, and Air-Conditioning Engineers (ASHRAE) 90.1 path. This standard was developed jointly by the American National Standards Institute (ANSI), ASHRAE, and Illuminating Engineering Society of North America (IESNA) and provides the minimum requirements for energy-efficient design of most buildings, except low-rise residential buildings. It offers, in detail, the minimum energy requirements for design and construction of new buildings and their systems, new portions of buildings and their systems, and new systems and equipment in existing buildings, as well as criteria for determining compliance with these requirements. The most recent update to ASHRAE 90.1 is the 2016 edition that requires building envelope verification in support of reduced air infiltration. Because of the flexibility that wood provides during the design stage, it is an ideal material to comply with the prescriptive, performance, or ASHRAE 90.1 requirements. Insulation strategies vary, but wood framing allows for options that can improve the overall thermal performance of the building. One of the key means for achieving energy efficiency in building enclosures is to ensure greater thermal insulation levels throughout the building envelope. Greater insulation combined with a complete moisture- and vapor-barrier strategy can be code compliant and provide exceptional thermal performance, comfort, and durability for the building. Insulating layer is located on the interior side of the water-resistive barrier. For walls, this typically means the insulation is located within the stud space. For roofs, the interior insulation may be located above the sheathing but under the roof membrane or, alternatively, below the sheathing within the roof framing. Both are considered interior insulated. Insulating layer is located on the exterior of the water-resistive barrier—i.e., the likely wet zone. 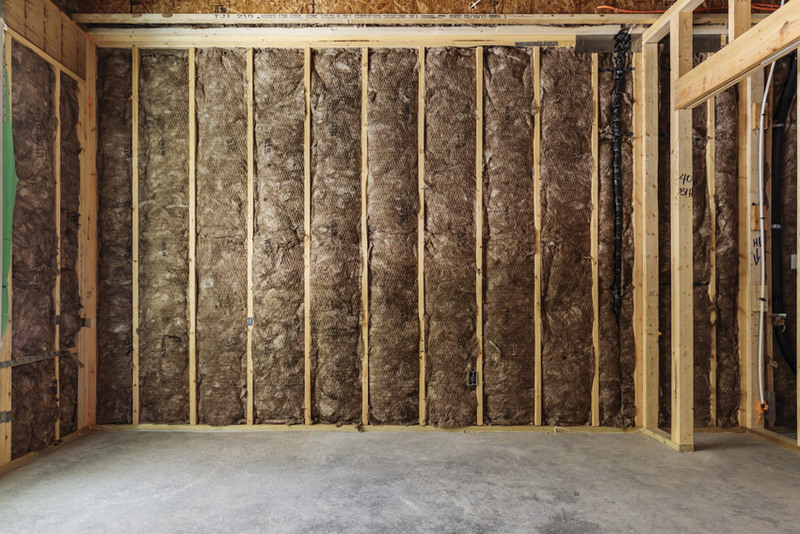 For walls, this means the insulation is located within the drained cavity space, while for roofs this means the insulation is located above the membrane (i.e., an inverted roof or protected membrane assembly). For mass timber systems (e.g., cross-laminated timber walls), this is the preferred insulation strategy to protect the wood from moisture accumulation. Exterior insulation materials must be resistant to the effects of moisture. More than one insulating layer is provided, typically with one layer provided to the interior and one layer to the exterior of the water-resistive barrier. 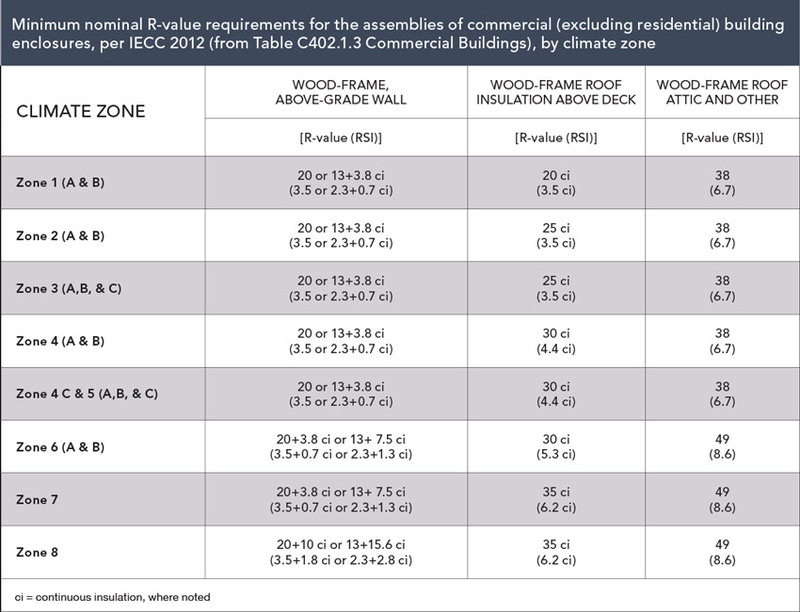 Minimum R-value requirements for above-grade wood-frame building enclosure assemblies in the 2018 IECC are provided for “commercial” buildings (including most multiunit residential buildings) in IECC Table C402.1.3 (see right). They are broken down by climate zone, as defined in the U.S. Department of Energy’s climate zone map. Under the prescriptive path of the 2018 IECC, walls, floors, and roofs have specific insulation requirements based on framing type and climate zone. For example, above-grade metal-framed walls in climates zones 3 and 4 (except Marine) are required to have R-13 cavity insulation and R-7.5 continuous insulation applied to one face of the wall. The wood-framed walls at the same location are required to have R-13 cavity insulation and R-3.8 continuous insulation or have R-20 cavity insulation with no additional continuous insulation requirements. The option to forego continuous insulation requirements on wood-framed walls with R-20 cavity insulation acknowledges that metal studs have a significantly higher thermal conductance than wood studs. The R-20 cavity insulation option allows wood wall frames with 6-inch-deep studs to meet the prescriptive wall requirements with no continuous insulation in climate zone 4. The R-20 wood-framed wall is the only option available in the IECC prescriptive wall path using prescribed R-values that does not require continuous insulation for above-grade walls. Unlike the IECC, the prescriptive path of ASHRAE 90.1 does not contain the option to reduce or forego continuous insulation in wood-framed walls with the use of R-20 cavity insulation.